This is a page for posting Audio Sermons. I do not necessarily endorse 100% of the views and beliefs espoused in each sermon. Be discerning and check everything in the King James Bible. Why You Should Use the KJV A sermon by David Brown explaining why you should use a King James Bible. Evil and Suffering A sermon by Walter Martin discussing evil and suffering. 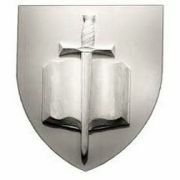 KJ Defense 1 A study by Scott A. Johnson defending the King James Bible. KJ Defense 2 A Study by Scott A. Johnson defending the King James Bible. KJ Defense 3 A Study by Scott A. Johnson defending the King James Bible. KJ Defense 4 A study by Scott A. Johnson defending the King James Bible. Politically Correct Churches A sermon by Dan Botterbrodt discussing political correctness in the church and liberals. Transformation A sermon by C.D. Brooks discussing carnality VS spirituality. Get up A sermon by Ben Davenport about the accursed thing.